This week on Now and a Long Time Ago, GM slides down M St. a bit to M and 31st. 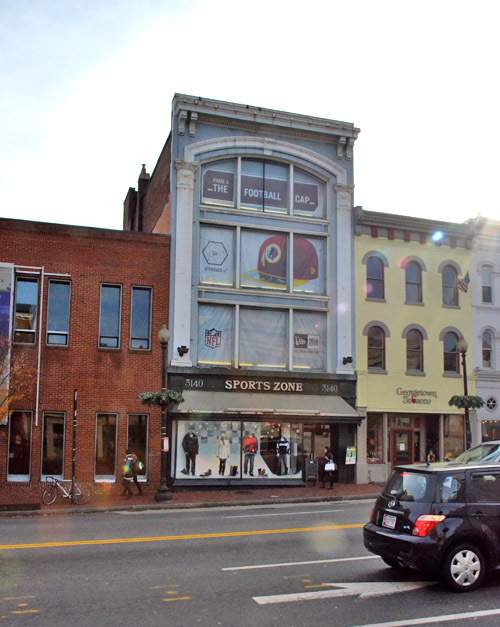 Today the three buildings in question hold a German television station, Sports Zone, and Georgetown Tobacco. The first thing that GM noticed looking at the Library of Congress’s shot of these buildings from 1966 is that the huge windows were there already. GM always figured they were a more recent addition. Well according to the report of the American Historical Building Survey, the windows are original to the building. It was built around 1909 and the AHBS describes it as “an unusual structure for Georgetown…[which] typifies an increasingly rationalisitic and functional early twentieth century approach in commercial.” In essence, this building is a proto-modern structure. While it still embraced the classical ornamentation, it pointed towards the clean and glassy aesthetic that would ultimately dominate 20th century architecture. 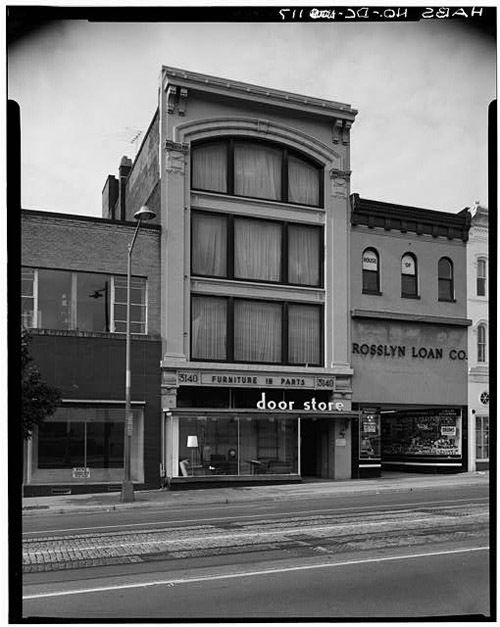 To be fair, back in 1966 the tenant, a furniture store called the Door Store, also blocked all the windows (at least in this case it was with curtains, not ugly ads). It would be such a better use of this beautiful facade for the interior to be opened up to the outside. In the 1920s, this property was a furniture store. It appears to have become a Sears retail store in the 1930s. By the 1950s, it was a Western Autos autopart store. On April 29th, 1951, a recently fired employee tried to break into the safe after hours. He failed, and decided to burn the building down. He was arrested and convicted for arson, receiving a 3-9 year sentence. According to the Post, while drums of oil kept in the basement worsened the fire, luckily the shotgun shells kept upstairs did not go off (Western Autos also sold guns). It appears the fire was so bad that Western Autos never reopened. By 1957 the Door Store was there, which itself appears to have stayed open until the mid 80s. GM’s not sure what was there between then and 1997 when the Sports Zone opened. As for the store at 3144 M St. (Georgetown Tobacco’s space), it appears to have been a pawn shop called Rosslyn Loan Co. According to Georgetown Tobacco’s website, they opened in 1964, but they must have been at a different location initially. There was a pawn shop at that location until at least 1969, but Georgetown Tobacco was definitely open there by at least 1971. Actually the Door Store was still open in the early 90’s when I started at GU, and I seem to recall they had a sort of outlet store for their floor samples or clearance furniture somewhere else in the neighborhood…I want to say down by the old Bayou club, but I am not sure. I got my first couch there in 92 or 93, they had some good decently made stuff. We finally retired it after 20 years. I’m more intrigued by the windows next door at Georgetown Tobacco! If those are a recent addition, they did a beautiful job. Or were they lurking under the Rosslyn Loan Co sign? I don’t mind the ad in the windows if it is done tastefully and legally. That is part of retail business and is very eye catching to shoppers walking across the street. The addition windows added at Georgetown Tobacco are definitely a nice touch. What always seems out of character to me is the German TV office building to the left of Sports Zone.